It was the day after hurricane Irma had hit Puerto Rico, and Luis Galarza Figueroa was left without options. Walking outside of his family’s home in Barceloneta after the storm subsided, he could see trees and cables on the ground. The power, something Figueora needed for many things including his burgeoning competitive gaming career, was gone. Figueroa plays Overwatch under the name “iRemiix,” and under the banner of both Splyce and Kungarna had tallied up strong placings throughout 2017. On the precipice of the Overwatch League’s roster lock date of Oct. 30, teams had and have been conducting tryouts for players, Figueroa among them. But after Irma came through Puerto Rico, his family and home were left with just a small generator for power and no Internet. Even cell contact was difficult to obtain, with antenna damage making it difficult to find a spot where his phone could obtain a signal. Left with just a small generator to keep food from spoiling and no Internet connection, Figueroa’s Overwatch career and livelihood was uncertain. But when the ability to contact the outside world returned, Figueroa was able to reach out to a safety net: a team he had tried out for a month ago. Back in August, the San Francisco Shock Overwatch team, part of the NRG organization, had been running online tryouts that included, among other players, Figueroa. He had tried to qualify for them before the storm but had missed the cut. The team’s coach, Bradford Rajani, had nevertheless developed a good relationship with Figueroa, Rajani told Compete. When Irma started to make headlines, the coach gave Figueroa his personal cell number and told him to call if he needed help. After Irma blew past the island on Sept. 8, Figueora went searching for a spot where cell connection could still reach Rajani. It was 5 a.m. and he found a spot where he could send a text. He wanted to take NRG up on their offer. He hadn’t made their team, but if he could get somewhere with good Internet and power, maybe he could still qualify for another Overwatch League team. The San Francisco team came through. 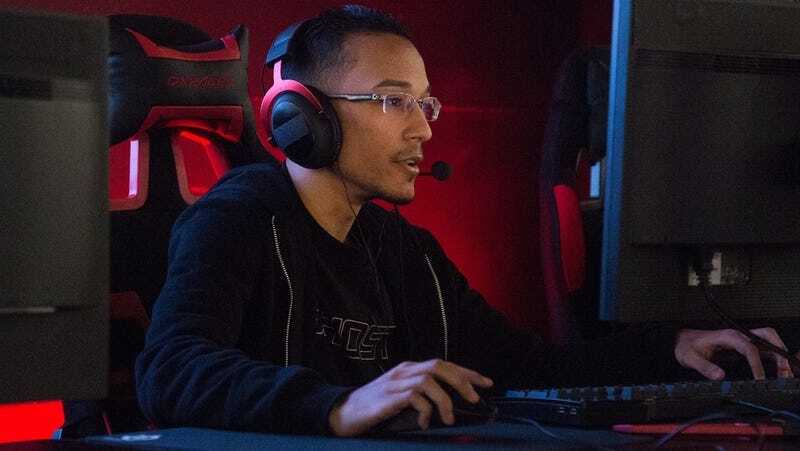 Later in the day after Figueroa reached out on Sept. 8, they flew him out to their Las Vegas gaming house, where the team had spare rooms and gaming PCs to offer. They let him stay there while he tried out for other Overwatch League teams. Despite having never met the player in-person—all tryouts had been online over the course of a few weeks—the future San Francisco Shock team hosted a player, to help him try out for a team that would one day compete against them. NRG’s offer to Figueroa is not the only act of charity in the wake of the hurricanes and other disasters across the United States. Call of Duty player Bryan “Apathy” Zhelyazkov hosted a 24-hour charity stream on his Twitch channel, raising over $3000 in donations for relief efforts. Zhelyazkov, whose wife is from Puerto Rico and has family on the island, told us over the phone that it was amazing to see so many people show up for a 24-hour stream announced the night prior. In Houston, floods from hurricane Harvey had damaged countless homes and buildings. Brad “Scar” Vaughn hails from the region. He is an Injustice 2 player who was competing in Dallas at the time and had to stay there while people evacuated. In a phone call, Vaughn described the situation in his hometown. Vaughn’s organization Echo Fox, through its private equity firm’s philanthropic arm Vision Global Foundation, will be donating $25,000 to Americares to support his city and hurricane relief, as well as donating to Lin Manuel Miranda’s Puerto Rico donation drive for their Gears of War player Jamie “ToySxldier” Rivera and to victims of the Las Vegas shooting. For Figueroa, life moves on. He has moved on to a new house where he is continuing tryouts. He wouldn’t say which teams he’s trying to get into, but he was positive about the results and potential. While that aspect of his life is moving forward, the situation in Puerto Rico continues to take its toll on those still on the island. Both Figueroa and Zhelyazkov relate stories of family members struggling, with the former saying his family is currently on a single meal a day to conserve food. Although some say relief efforts are proceeding, the speed at which it is happening is a different story. Figueroa says he keeps looking forward, playing his game and pursuing his career while watching the news, staying in contact with his family through delivered messages out of San Juan. His family expects to have no power or water for months, and will stay on one meal a day for the time being. While the powers that be struggle to provide aid, acts of kindness are at least allowing a prospect like Figueroa to continue to pursue his passion, despite natural events working to dissuade it.